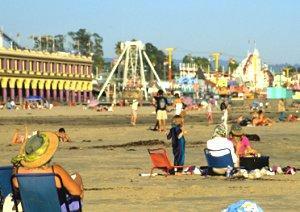 Enjoy the beach and more in Santa Cruz. As the oldest theme park in California, the Santa Cruz Beach Boardwalk offers visitors a glimpse of the nostalgia of amusement parks of yesteryear combined with the thrills of modern attractions and fun entertainment. With something for everyone, this enchanting park in Santa Cruz is sure to entertain guests for years to come. This seaside park first opened in June 1907 and for more than 100 years it has delivered pleasing family entertainment for everyone. In the early 20th century, oceanside parks and boardwalks were exceedingly popular, but during the Great Depression and World War II many of these smaller parks were closed and abandoned amusement parks rested on many beaches. The Santa Cruz park, however, thrived and grew, and today it enjoys status as a historic landmark, ensuring that it will be available for future generations' enjoyment. The park's dozens of rides and additional attractions are a great way to pass either an evening or a full day's theme park getaway. The park is open year-round, though in less busy months different rides and attractions may have limited operating hours. Giant Dipper: Built in 1924, this old rollercoaster is a wooden wonder and reaches speeds up to 55 miles per hour from its 70 foot tall initial hill. The half mile track dips and winds along the edge of the boardwalk, and because of its popularity and nostalgic appeal, the Giant Dipper is a designated National Historic Landmark. Looff Carousel: This exquisite carousel has 73 unique horses with intricate hand-carved details. Built in 1911, the Looff Carousel is one of very few that still has a ring machine for riders to grab, and its classic pipe organ fills the ride and the midway with instantly recognizable carnival tunes. Hurricane: This twisted steel coaster may seem small, but with 80 degree banked turns and a tight track layout, riders will feel in excess of four times the force of gravity during the tumultuous ride. Double Shot: The best view in the park is from atop the 125 foot tower, but guests only get a brief glimpse of Monterey Bay and the park as they are thrust upwards with forces three times gravity. In addition to these popular thrill rides, the Santa Cruz park has a wide selection of smaller carnival rides, including spinning rides, a sky ride, pirate ship, dark rides, and classic flume boats. Younger guests will enjoy the variety of kiddie rides, including jets, buggies, boats, and more. Strike the fun at the Boardwalk! In addition to the fun at the park, the nearby beach is a popular attraction for many guests. The calm, cool waters and sandy beachfront are perfect for a summer picnic or a quick dip anytime. There is no admission fee to explore the park, but each ride and attraction does require a fee. Rides accept tickets (between three and six tickets per ride), which cost $.75 each or can be purchased in a book of 60 for $40, perfect for a family or group to split. Individual all day ride wristbands are available for $30, and other package deals are available that include some of the boardwalk's other attractions. Season passes include a discount book for different attractions and cost just $69 for a full year of seaside fun. Group discounts and special offers are available, including printable coupons and other savings. Contact the park for more information and updated offers.